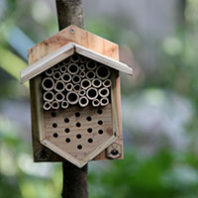 Help some local pollinators by building your own bee hotel. There are plenty of tutorials and guides out there. Below are a few easy steps to quickly building a home for solitary bees, followed by links to some other guides. With a craft knife, cut both ends off the plastic bottle to create a cylinder. Make your lengths of bamboo, grass or reeds 3 cm shorter than the bottle to protect them from rain – use sharp garden clippers to trim them. Bees can’t burrow through the knots in bamboo, so avoid lengths with too many knots.